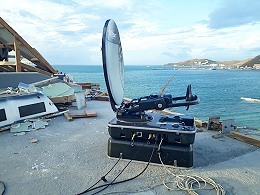 Eversat deployed its flyaway uplink antennas to Caribbean. Paris, January 2018: [Source: Eversat] In September of last year Hurricanes Irma and Maria ravaged parts of the Caribbean islands. On the island of Saint Martin homes and businesses were submerged by a storm that was the worst to have hit the island in a century. 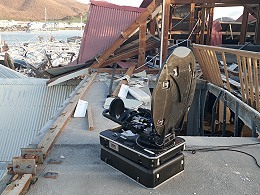 The first satellite terminals to be deployed to the Caribbean were the Eversat LightAway satellite suitcases which were an invaluable support to the TV crews and first responders. Wireless communications are critical for first responders during emergency operations following natural or man-made disasters. Often after a disaster, terrestrial networks are completely destroyed. In the best case, terrestrial networks still exist but because of the huge communication demand due to the crisis management, the networks fail to deliver the necessary bandwidth with a good Quality of Service. In fact a network only based on terrestrial architecture can’t be the right solution after a terrestrial disaster. Recent developments in satellite technologies are able to bring a reliable broadband connectivity on earth even if terrestrial networks are down. For crisis management, first responders need to establish radio networks and then extend their coverage within the region. Satellite terminals are often used as the backhaul solution for these radio networks. For news coverage, TV crews have to cover the story as fast as possible with the minimum equipment and with the best video quality. Of course in this type of situation it’s not possible for TV and news agencies to book a commercial plane and carry 100 kg of transportable satellite antenna. Relief agencies often have to fly or drive in food and water supplies along with the communications equipment. As a conclusion, size, weight and the ability to bring the system on-line very quickly are critical factors for both first responders and TV crews. In addition, because of the adrenaline pumping due to the critical situation, people on site in charge of the communication equipment are looking for the most easy to use satellite terminal. In fact, in this situation people on site are looking for the mobility of a cell phone with the high throughput of the optical fiber! The Eversat LightAway is the easiest to use portable satellite terminal in the world. This satellite suitcase is ideally suited for broadband Internet connectivity and Fast News Gathering. Weighting less than 30 kg, the single suitcase meets International Air Transport Association (IATA) limits and can be checked as airline luggage. In addition, the LightAway can integrate a satellite router, a Wi-Fi hotspot and a battery pack for more than 3 hours of communication in the field. Its quick deployment, high-speed communication capability and convenience makes it ideally suited for news coverage from difficult locations, for disaster relief applications, corporate and other video conferencing situations, as well as providing temporary Internet access for remote workers. Used worldwide by Military forces, security agencies and TV crews in harsh environment, LightAway satellite suitcases are ready to transmit in less than five minutes by using an unmatched automatic satellite pointing system without need of manual intervention or test equipment for the final adjustment.